Jessie Daniels tackles Keith Brown. Craig Steltz tackles Matt Caddell. #4 vs #5. SEC West Championship on the line. National TV audience on CBS. The best matchup of the day in college football. Mike Shula's Crimson Tide had won their first nine games, including six conference games. They were unbeaten despite scoring only one offensive TD in their last three SEC games. The game provided a number of interesting story lines. Each had his critics. Les Miles was no Nick Saban, and Mike Shula was not his father Don, the longtime Hall of Fame coach of the Miami Dolphins. Miles had a tough act to follow but won over LSU fans with the way he handled the Katrina crisis and the stirring victory at Arizona State. 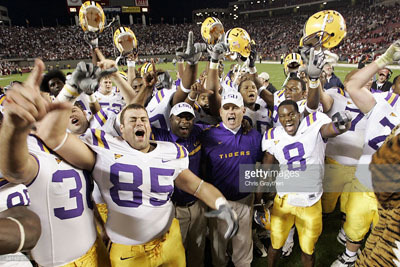 Then LSU lost, blowing a big lead against Tennessee. Not even six straight victories had convinced the skeptics. The Tigers were the most penalized team in the SEC, and only Kentucky had a worse turnover margin. LSU had yet to put together a solid 60 minutes against a Top 25 or SEC team. 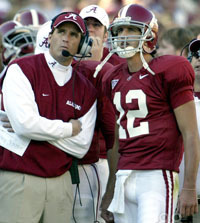 A former Bama QB, Shula took over the Alabama program when Mike Price was abruptly fired right after spring training 2003. The 38-year-old Shula inherited a program on probation with a limitation on scholarships for several years. Still, many Tide fans cut him no slack when he went 4-9, then 6-6 in his first two years. President Robert Witt felt it necessary to announce that Mike's job was not in danger, citing the challenging circumstances he faced and asking for patience. 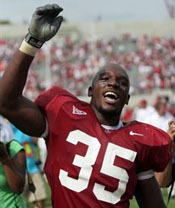 Not even the 9-0 record in '05 silenced the diehards, who pointed out that the Tide were winning ugly. 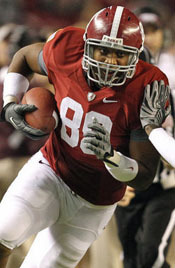 Playing for Williamson High School in Mobile, JaMarcus Russell set the Alabama high school passing record with 10,774y. 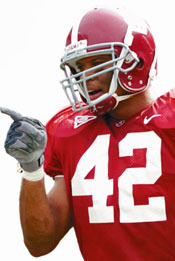 The previous mark of 9,321y was set two years earlier by Brodie Croyle, then of Westbrook Christian School and now the starting signal-caller for the Tide. 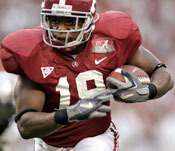 Russell, who never seriously considered either Alabama or Auburn during his recruitment, had been striving for more consistency in recent games. His 2005 game log revealed his ups-and-downs. 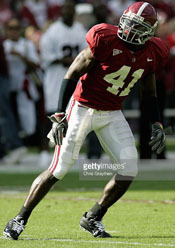 JaMarcus had feasted on the weaker teams (MSU, Vandy, North Texas, Appalachian State) but not performed nearly as well against Arizona State, Tennessee, Florida, and Auburn. Which Russell would show up in Tuscaloosa? Tennessee coach Philip Fullmer, whose team benefitted from a fumble, an INT, and several other blunders by Russell in their comeback win in Tiger Stadium, gave his opinion on the LSU QB. 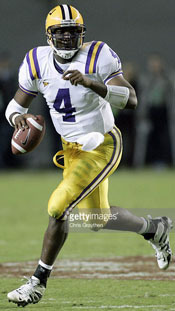 JaMarcus Russell, if he's on, he's a really special football player. JaMarcus turned his cell phone early in the week of the Alabama game because he was swamped with tickets requests from friends back home. 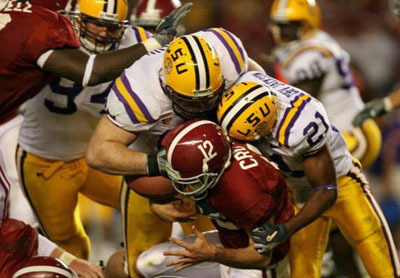 Croyle had endured an injury-plagued tenure in Tuscaloosa, including missing the 2004 game at LSU. So far in '05, he had thrown 12 TD passes and only 4 INTs. He had failed to complete 50% or more of his passes only against Arkansas (13-for-27). Fullmer on Croyle, who played steady if not spectacular ball in the Tide's 6-3 victory over UT: Brodie Croyle, to me, is a winner. He's a guy that's going to get the football out there and throw it exactly where he wants to. LSU boasted the No. 2 scoring machine in the conference, averaging 31.8 ppg. Jimbo Fisher's unit topped the SEC in redzone offense, scoring 24 times in 27 tries, with 19 TDs. Russell ranked second in the league in passing efficiency with a 146.3 rating. C Rudy Niswanger explained his QB's improvement. For one thing, he's calmed down a lot. It's not that he was necessarily hyper, but when a real young QB sometimes comes in and they are kind of nervous about things. Sometimes he'll come into a huddle in the game, and everyone's tired, breathing hard. Everyone's too excited. And he'll say, "All right. Everybody breathe. Sit there. OK." Then he'll call the play. He's learned to recognize what the guys around him are going through and how to help the situation. The highest SEC ranks of the Alabama offense were 4th in Pass Efficiency Offense and 5th in rushing (159.4ypg). They were 6th in Total Offense (379.4). 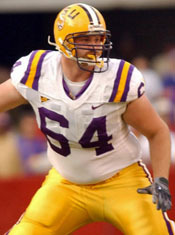 Dave Rader's unit had not been as productive since WR Tyrone Prothro suffered a broken leg in the 5th game. They had just been hit with another broken leg, this one belonging to senior C J. B. Closner. The LSU unit was outstanding but Alabama's was even better. The Tigers ranked sixth in the nation, allowing 13.9 ppg. LSU hadn't given up a TD in eight quarters but that spanned two nonconference games. In its last seven games, Bo Pelini's defense had allowed just 23 points in the first half. 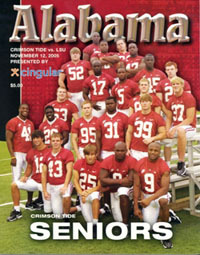 The game would be the last one at home for 23 Alabama seniors who had been through a "wild ride" during a period when the school had four coaches in five years. Croyle spoke for the group when he told CBS: It's been a wild ride ... a rollercoaster ride, but we're right where we want to be. We want to leave our legacy on the program and with a game this big, we couldn't ask for a better going away party. ESPN's GameDay crew pitched its tent in Tuscaloosa for their morning show. Kirk Herbstreit brought a cheer from the crowd when he picked Alabama. But Lee Corso ended the show by donning a Tiger head. Many fans cheered that pick also and one fan wearing Alabama garb explained why when he screamed, That guy couldn't pick a game right to save his life. Among the spectators in the stadium were Supreme Court Justice Clarence Thomas, who had given a guest lecture at the Alabama Law School the day before. Another visitor was the star QB from Nease High School in St. Augustine FL making his third visit to Tuscaloosa. Tim Tebow had narrowed his college choices down to Alabama and Florida. 81,018 gathered on the beautiful fall afternoon (75°, 9 mph wind) for the first-ever matchup of top five teams in Bryant-Denny Stadium. Q1: LSU won the toss and deferred. Alabama started with a completion on their first offensive play for the tenth straight game. A hands-to-the-face penalty on DB Ronnie Prude added 15y to the 12y pass to immediately put the ball at the LSU 48. But the Tide had to punt after Croyle overthrew open WR DJ Hall down the right sideline on 3rd-and-12. All afternoon, punter Jeremy Schatz refused to boot the ball out of bounds. He would kick the ball to Skyler Green seven times, but the SEC's leading return man at 15.6y per return ran back only one of them - for 1y. Thanks in part to a 5y false start penalty, the Tigers gained just 3y in three plays. Joseph Addai started but re-tweaked his bruised ankle after a 2y run on 3rd down. The home team missed an excellent chance to take the lead when freshman RB Theo Townsend roared in unblocked but took a bad angle and whiffed on the punt. Starting from their 42, the Tide moved into enemy territory on a gorgeous 26y pass won the left sideline over CB Trevis Jackson to Keith Brown to the 30. RB Kenneth Darby gained a yard before two incompletions by Croyle under heavy pressure brought in K Jamie Christensen for a 46y FG attempt that missed wide right with 9:52 on the clock. 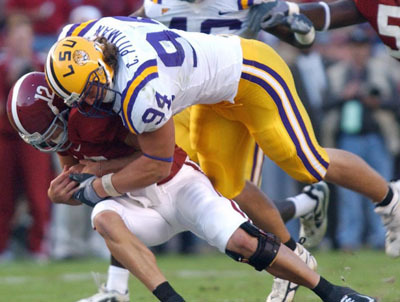 The Crimson defensive dominance continued as LSU again went three-and-out. Addai came out again but left and gained 2 on 2nd down, retweaking his injured ankle in the process. For the rest of the game, he was relegated to 3rd down plays as a blocker or decoy. The coaches had no choice but to rely on junior Justin Vincent to carry the rushing load. 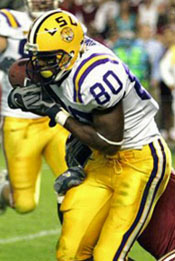 Vincent had been a freshman sensation on LSU's 2003 BCS Championship team. He gained 1,001y and was voted MVP of both the SEC and BCS Championship Games. But he returned for his sophomore season out of shape and lost his starting job to Addai. Justin gained only 322y that year. Alabama again drove across midfield and this time cashed in. On 1st down from the 22, Croyle found Hall slanting in for a 9y gain. Then Darby scampered 21y on a draw play to the LSU 45. 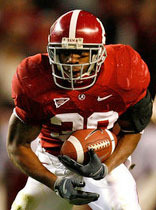 Following an incomplete pass, Glen Coffee roared around LE for 14y to the 31. Two snaps later, Darby eclipsed the 1,000y mark for the season with a jaunt around the right side to the 17. On 1st down, Croyle tried in vain to hit TE Travis McCall in the EZ. On 3rd-and-4, Brown was held up by DB Jonathan Zenon 5y before the line of scrimmage. As a result, Croyle's rushed pass to the left corner of the EZ fell harmlessly to the turf. After the game, Alabama O-coordinator Dave Rader expressed disappointment that interference wasn't called on LSU on either the 1st or 3rd-down incompletion. The visitors then consumed nearly five minutes of playing time but netted only 16y. Russell connected with Dwayne Bowe for a 1st down. Then an ineligible man downfield negated a 25y completion to Dwayne. Later, Vincent bounced off several tacklers to move the chains. But a sack 15y behind the line was too much to overcome. On 2nd down after another excellent Jackson punt to the 16, Croyle scrambled and saw Hall releasing deep behind the secondary. But he overthrew him. Then Tim Castille bolted for 15y to the 31 as clock wound down for the first 3rd down conversion by either team. Melvin Oliver tackles Kenneth Darby. 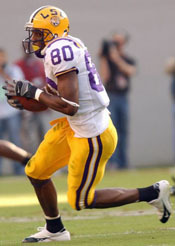 LSU's offensive frustration continued. The Bengals moved inside the Alabama 30, thanks to a 22y pass to Bowe. But a sack on 3rd down forced a punt. 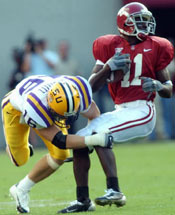 The Crimson Tide couldn't overcome a holding penalty and got a great 52y punt that Green fair-caught on the LSU 35. Still, that was the Tigers' best starting position of the half. Russell escaped the rush to his left and flipped the ball effortlessly to Buster Davis for a gain of 22. The first of three reviews of Davis catches upheld the call on the field. On 3rd down, Davis snagged a bullet across the middle to give LSU its first 3rd down conversion. However, the visitors went backward when a double reverse was sniffed out, resulting in a 12y loss. Thanks to a pair of Tide penalties, though, LSU soon faced a 3rd-and-7 at the 26. But Russell misfired to bring in Chris Jackson for a 43y FG attempt that he pulled left with 3:52 remaining. The Tide maintained possession the rest of the way. 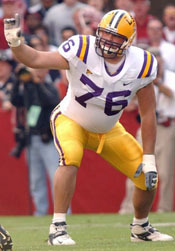 They gained three first downs and reached the LSU 38 before the half ended with LSU's first sack of Croyle. Chevis Jackson and friends sack Croyle. The halftime statistics told the sad tale for LSU. The Tigers gained just 72y (with a measly 1y rushing) to 207 for the Tide. The visiting team had as many plays lose double-digit yards as plays that gained double-digit yards - three apiece. The LSU locker room was quiet, but there was no panic. First, Les Miles addressed the team and said it was time to play "LSU ball." Next, offensive coordinator Jimbo Fisher talked about coming in here with guys wearing LSU helmets and wanting to leave here with people who should play with pride to wear them. He said he was not proud about what he saw in the first half. But the most effective speech came from senior captain, DT Kyle Williams. He explained after the game what he said. I don't think in the first half that we were playing together. We let them jump out on us, and they were getting a lot more than they should've gotten. In the first half, we didn't play our kind of football. We gave them a lot of things through not tackling and not filling gaps, the things we're responsible to do. I challenged everybody to play together and rely on one another. I felt like there was some finger-pointing going on, and if we couldn't relay on each other, then there's no chance we were going to beat a really good football team. DE Chase Pittman said Williams was intense. Any time he talks, you listen because he's our leader on defense. When he's talking, everybody listens and he gets us jacked up. ... He's been around big games, and he made sure we knew this was one of those. Q3: LSU came out like Tigers. Starting from the 20, they drove 70y starting with passes to Davis for 17y and Vincent in the flat for 26 to the Bama 37. A questionable interference penalty on the next play aided the advance. Vincent ran the ball four straight times for a total of 20y to set up 2nd-and-goal from the 2. After Hester gained nothing and Russell reached the 1 on a QB draw, Miles didn't hesitate to go for it on 4th down. Vincent: I told the coaches I wanted the ball. Actually, the play was supposed to go to the FB again. I just kinda said, "Man, I want the ball." ... I didn't even know it was fourth down. I don't know if I should even admit it. I was just so excited, I felt like I was in a groove. I was jumping around saying, "We've got to get it.". Shula: We felt pretty good going into the half. But it was really important to get off to a good start in the second half. The opposite happened, for the first time all year. The home team couldn't respond. 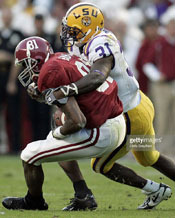 Inspired by the offense's success, the LSU defense played more aggressively, disguising its blitzes and coverages better and finally taking advantage of an offensive line that featured two redshirt freshmen and a first-time starting C. Alabama gained 1y on two snaps before FS Landry burst up the middle unimpeded and smashed Croyle down to force a 4th-and-21 punt from the EZ that bounced back to the Bama 45. Afterward, Fisher commented on Russell's reaction after failing to connect with Zinger. The fact that JaMarcus didn't let that throw eat into his confidence was an example of how he's matured. He's got a special fire in his belly that makes him special to go along with that arm of his. Against one of the best defenses in the country, he showed he can make the plays that count. The visitors' momentum continued when a sack of Croyle led to an Alabama punt that Green was finally able to return. But a holding penalty on the kick returned the ball to the Tide with a fresh set of downs at the 37. It was the 23rd first down on an LSU penalty for the season. In two plays, Bama had a first down at the LSU 47. However, a sack of Croyle on 3rd-and-6 brought the punt team back onto the field as the quarter came to a close. Alabama netted only 4y of offense during the period, with their only first down coming on a penalty. DE Melvin Oliver on LSU's second half performance. Nothing changed. It was just the intensity. We kicked up about three notches and showed how good our defense was. Q4: On the first play after the punt to the 12, Alabama lost one of its LBs. Juwan Simpson sprained his ankle chasing Russell. He left the game and didn't return. On the next snap, the rangy QB ran up the middle on a draw for 14y. Then an out pattern to Bowe gained 12 more. Two plays later, Davis made a diving catch at midfield that was overturned on review. Undaunted, Russell looped a pass down the right sideline for 27y to Bennie Brazell, who ran an out-and-up. But the next three plays gained only 7y. That set up a 46y FG attempt for Jackson. The boot had the distance but sailed just left of the upright. Chris was now mired in a 3-for-11 slump. With DTs Williams and Wroten pinching inside more to free Oliver and Pittman to attack the edges more aggressively, the Tiger defense continued to stifle Croyle & Company. Brodie threw off his back foot even when he didn't need to. Schatz punted to the LSU 31. The Tiger defensive coaches thought that Bama's first-half performance gave them confidence they lacked coming into the game. As a result, Croyle's first-half success made him comfortable enough to drop back five or seven steps, which exposed him longer to the pass rush. 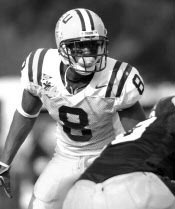 He never did adjust and take three-step drops and dump the ball as quickly as possible or roll out to avoid the rush and give receivers more time to get open. Irly Doucet made his only catch of the game but gained only 7 on 3rd-and-10. So for the first time in the half, LSU went three-and-out. Jackson's 53y kick gave the Tigers a decided advantage on the exchange of punts. Backed up to its 9, UA went back further when a low snap led to a sack of Croyle on the 5. Green fair-caught the punt at the Bama 41. LSU S Jessie Daniels: We were disguising our coverages great - from our nickel backs, dime backs, cornerbacks, safeties - the whole secondary. We were showing down when we weren't blitzing and we were disguising the whole scheme. The whole second half, Croyle didn't know if we were coming after him or not. He was giving run checks, and they'd run right into our blitz, or he was checking into a pass and throwing right into our coverage. He was confused the whole second half. LSU could not take advantage of the field position, losing 4y on three snaps. Jackson then pinned the Tide back at the 4. Chris did a much better job of punting that place kicking. He averaged 45y on six boots. Hoping to make some first downs to at least change field position, Croyle threw out of the EZ on 1st down though the hands of TE Nick Walker. Soon it was 4th-and-4 - punt time. Green caught the kick at midfield, tried to get away from the coverage, but went down where he started. Vincent gained 2 before Bowe dropped a pass as he was hit to bring up 3rd down. Davis bailed out his fellow WR with a diving catch for a 1st down at the 38 - the completion being upheld by replay to make Craig 2-1 in reviews. As the clock ticked under two minutes, Justin gained 5 on two rushes, carefully keeping the ball in the center of the hashmarks. After LSU used its last timeout with 1:10 left, a scrambling Russell missed a chance to give Jackson a much easier FG try when he overthrew FB Jacob Hester running down the right side in a futile attempt. So Chris put his foot into the ball from midfield but missed for the third time with 0:54 on the clock. Starting from their 32 with two timeouts left, Bama hoped to get close enough to try a FG of their own or at least throw a Hail Mary to the EZ. After two passes gained 8y, Shula called timeout with 24 seconds to go. Darby then ran for the 1st down but didn't get out of bounds. On the next snap, Darby did get out of bounds with 0:09 showing. Croyle then threw too long to Hall racing one-on-one with Prude. With two seconds to go, would Bama just take a knee? They took a timeout to talk it over. 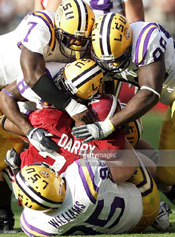 When play resumed, LSU deployed three defensive backs on the goal line. Croyle looked downfield but decided to toss the ball to Coffee, who brought the Tide fans to their feet when he ran down the right sideline 40y to the 8 where LB Kenneth Hollis tackled him as time expired. That one play more than doubled Alabama's total yardage for the second half. Before the 40y on the last play, Croyle's six other completions in the second half gained just 31, which matched the total he lost on four sacks. After averaging 4.8y a snap in the first half, Bama produced a paltry 1.3y over the final 30 minutes (without the final 40y gain). OT: To start its third OT of the season, LSU won the toss and elected to go on defense first. Alabama chose to play at the south end in front of its student section. Each team felt confident heading into the extra session. Miles: We felt going into overtime that we would win this football game because of the kind of football team we are. Whitworth had faith in his QB: I can't tell you how confident I felt looking into JaMarcus' eyes in the second half. It was like he was telling us, "Do your job, and I'll take you along for the ride." Here's a sophomore from Mobile, playing in front of an enemy crowd in his home state, having to prove himself. And he goes out and does it. I'm telling you, when it went to overtime, I just knew JaMarcus would find a way. I didn't know how, but I knew he'd get the job done. Shula: We just couldn't get any rhythm in the second half. For whatever reason, we kept going three and out. But then with overtime ahead, we thought we had an excellent chance to win the game. Croyle: We thought when we got to overtime the game was over. Their kicker had been a little shaky, and we thought we'd hold them. Darby gained a yard but an illegal shift penalty put the ball back on the 30. A 9y connection to Hall and a 4y gain by Darby made it 3rd-and-2 on the 17. 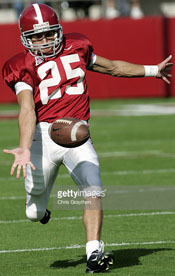 The pass completion gave Croyle exactly 6,000y for his career to move him ahead of Andrew Zow to the top of the Alabama list. Inside and outside pressure by the defense flushed Croyle out of the pocket. He threw on the run wide of Darby at the boundary. So Bama settled for a 34y FG by Christensen. Many fans questioned the play call on 3rd-and-2. 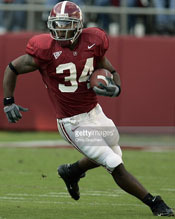 One posting asked, Can the Alabama offensive coaches help me understand a pass play on 3rd-and-2 in overtime when you have a running back in Kenneth Darby who has five yards per carry average to that point in the game? Russell began with a pass in the left flat to Vincent for a first down at the 15 thanks to a fine block by Doucet. Russell couldn't find an open receiver on the next snap and scrambled back to the line of scrimmage. Then a reverse to Xavier Carter via Vincent gained 4. A fine block by Russell prevented the play from losing yardage. Fisher called for "Ninety-three Yogi Z Post." He knew the call would light the eyes of Russell because it gave him five options. We needed six yards for a first down and 11 for a touchdown. I felt, if the opening was there, JaMarcus would go for the kill. That's how JaMarcus is. I can't tell you what that play right there meant to him, what it meant to this team. Bowe: I told Coach (earlier) "I'm going to 'Z post.' He can't cover it. And coach said, "You know what? We're going to run it." I said, "JaMarcus, just find me. If they double me, I'm just going to keep coming across. Just hit me in the hole." With Bowe lined up wide left, JaMarcus took the snap and faded back amid deafening noise. With Dwayne double covered by CB Anthony Madison and S Charlie Peprah, Russell rolled right to buy additional time. Meanwhile, instead of making a sharp post cut, Bowe looped behind Peprah as the CB let him go and came back toward Russell. 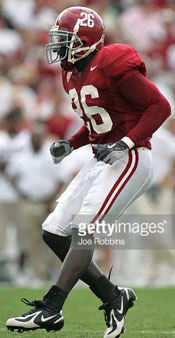 Alabama's 2002 Mister Football flicked his wrist and fired a strike to Dwayne in the middle of the EZ. 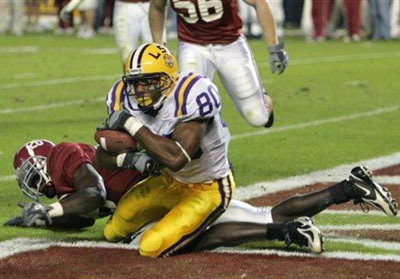 In that instant, Alabama's dream of an undefeated season went down the drain, and LSU controlled its own destiny in the SEC West. As the Tigers celebrated in the EZ, a hail of plastic cups and at least one glass bottle flew onto the field from the Alabama student section. Fisher on the winning play: It all depended on what the defense did and how quickly JaMarcus made his reads. He saw everything right away. He was looking for Dwayne right away, but he didn't rush it. He waited and then he made the throw. It wasn't an easy one to make under that kind of pressure. But he made it. That's what counts. That's what champions do. Russell: I knew he was coming across. I kept an eye open for him. Bowe: I caught it on my back shoulder. His (Peprah's) hand was on it, and I pulled it in. My teammates mugged me and jumped on me. Peprah, a fifth-year senior who had been recruited by Coach Dennis Francioni, regretted missing a chance to keep the game going. As an athlete, I felt I should have made the play. I was right there. My hand was on the ball. I just didn't rake it out. Bowe snags the winning TD. Neither team committed a turnover. It was the first time Alabama had not forced a turnover in 26 games. The Tide went from 16 first downs, 92y on the ground, and 115y in the air during the first half to four first down, 5y on the ground, and 72y passing in the second half. LSU went from five first downs, 1y rushing, and 71y passing in the first 30 minutes to 11 first downs, 45y on the ground, and 158 in the air the second half. Russell's final numbers were 30-16-0 for 229y. Bowe led the receiving corps with 98y on seven catches. Croyle went 40-19-0 for 187y. Darby led the ground game with 104y on 21 carries. 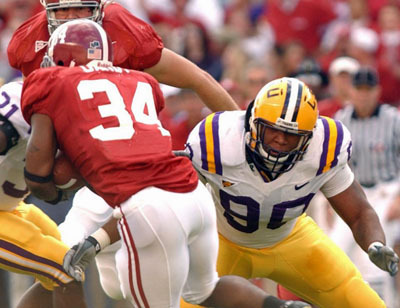 The LSU-Alabama series continued to defy logic when it came to homefield advantage. 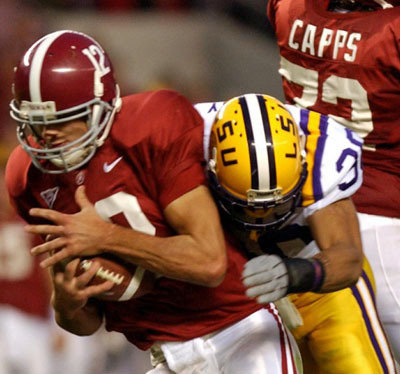 For the first time ever, LSU had won three straight games in Tuscaloosa. Since 1970, the road team in the series was 25-10-1. The Tigers were 8-2 in games played in T-town since 1982. Since 1991, the road team was 11-4. Miles: This is a predictable circumstance for this football team, considering how they started this season, what happened, how they responded, the character of this team. ... This football team has character. On Vincent, who gained 56y on 20 carries and added 36 more on pass receptions: I really felt Justin Vincent played a strong game. We're fortunate to have him cranked up at this time of the season. Vincent: It's a great opportunity for me. The coaches came to me (last week when Addai's status was in doubt) and said, "Justin, we're gonna need you." I guess it took time for me to show the coaches I was ready to play. I was just waiting for an opportunity. You can't do too much with one or two carries a game. It feels like the old me. OT Andrew Whitworth on Vincent: He is a guy that can really contribute. We've always had confidence in him. He's a guy that has had a couple of freak deals. On the second half resurgence: They were coming at us really heavily, and we decided to change our game plan and pick it up and hurt them with it, and we were able to do that and get big plays. I'm really excited with the way we turned it around. Bowe felt he had redeemed himself after dropping a sure TD pass in Q4 against Auburn. After the game, he vowed never to drop another pass. I told my guy (Russell) I was going to make up for that one, and I did. He really showed me something tonight. He was calm, cool, and collected in his home state amid all the hype. Russell on Bowe: I told him, no matter if he drops a pass or not, there will be days to catch another one. He's kinda the guy I look for when things break down. We have a lot of good receivers. Fisher on Bowe: He's the best I've ever had at adjusting his route. Just like JaMarcus can read him, he can read JaMarcus. Bo Pelini on his unit's turnaround in the second half. It wasn't that we made any big changes. It was more on cutting down on the mental errors. They hurt us in the first half. Then we forced them into making a few errors of their own. 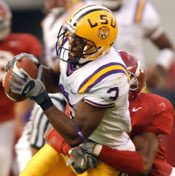 Williams called Alabama the best team LSU had faced all year. These are two very will-driven football teams. You could see it in some of the games we've won this year and some of the games they've won. We knew it was going to be a battle of wills, and we came out in the second half with a stronger will. With everything we've been through this year, and all the hard work we've done, we didn't want it to be in vain. We wanted to keep winning. Russell: When things don't happen like in the first half, you have to go out in the second half and make them happen. We had to get it together as a team and go after them. ... People have said I couldn't play in a hostile environment without making bad mistakes. I just wanted to help give our team a chance to win. I'd have to say this is the biggest win of my career - to come back here in my home state and win a game like this. Shula: It breaks your heart at how hard we played and breaks your heart for these seniors. Knowing they wanted to go out their last game here with a win is tough. We played well enough to win at times, but at times we just weren't good enough. On the offense's second half woes: We weren't protecting very well. We weren't running the ball well. On Russell: He has really matured. He stepped up and made the really big plays, and he made the big play there at the end. The thing he is doing now is not making very many mistakes. He has a ton of talent around him. He bought some time for himself and made some plays. Offensive coordinator Dave Rader: They're really a good defense. We had opportunities in the first half that did not result in the points we needed. It's always in the back of your mind when you're playing a good team like that it can come back to haunt you. 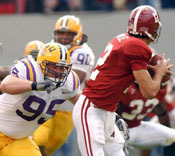 Croyle: All along, I said LSU was the game. If we win, we go to Atlanta, and if we lose, we don't. We came here to win the national championship and the SEC championship, and we aren't going to do either unless something crazy happens. ... If you're looking for somebody to blame again, here we (the offense) are. Our defense played well enough to win the football game. We shot ourselves in the foot again. ... We moved the ball at some points; we didn't move the ball at some points. But playing a good LSU defense, you aren't going to be able to move the ball up and down the field. ... We knew their best punch would come at some time. It happened in the second half. We didn't really counterpunch. 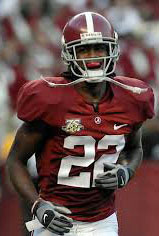 Darby implied that Alabama would have won if they had given him the ball more. We could run on them all night in my opinion. There were some little glitches we didn't pick up, little bitty things that we should have taken care of and execute. But I guess it didn't work out. C Taylor Britt after making his first start: I felt pressure. But everyone feels pressure when you start a football game for the University of Alabama. You just deal with it and play. I probably made a few mistakes here and there. But 98 (Claude Wroten) is quick as cattle and both their tackles are probably two of the best in the nation. Defensive coordinator Joe Kines praised his unit, which held LSU to half its scoring average: That first half was as good a half of football as we've played all year. The first drive (in the second half) got away from us. But we played a quarter and a half of pretty salty defense. On Russell: He's got a rifle. He slung it in there (on the game-winning pass) ... He's done some really good things all year. He's a heck of an athlete. He's got the whole package. LB DeMeco Ryans: We knew we had to win this game. We had destiny in our own hands. We worked hard to get to the SEC Championship Game, but this hurt our chances. ... Our offense gave us 10 points. The game was in our hands. If they don't score any points, they don't win. ... We weren't tight enough on our coverage (in the second half). We didn't hold long enough to get to the QB. He sat back there too long and picked us apart.